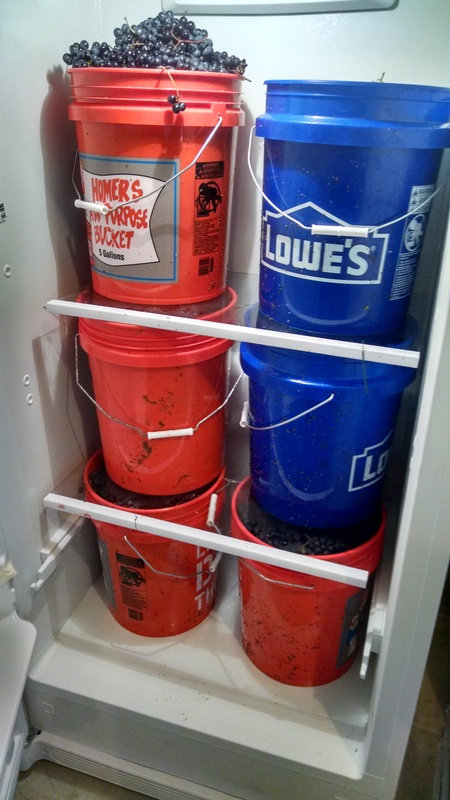 It was a tough year to be a weekend vintner. When you’re separated from your vineyard by a two-hour drive, you have to make the most of your time. And we try. But the weekends are short, and there’s so much to do. And every curve that Mother Nature throws your way puts you just a little bit further behind. This year, Mother Nature was throwing curves, sliders, and the occasional spitball. This year began with a late spring frost, followed by rain. Not just a little rain, but lots of rain, which gave rise to all kinds of fungal disease potential. 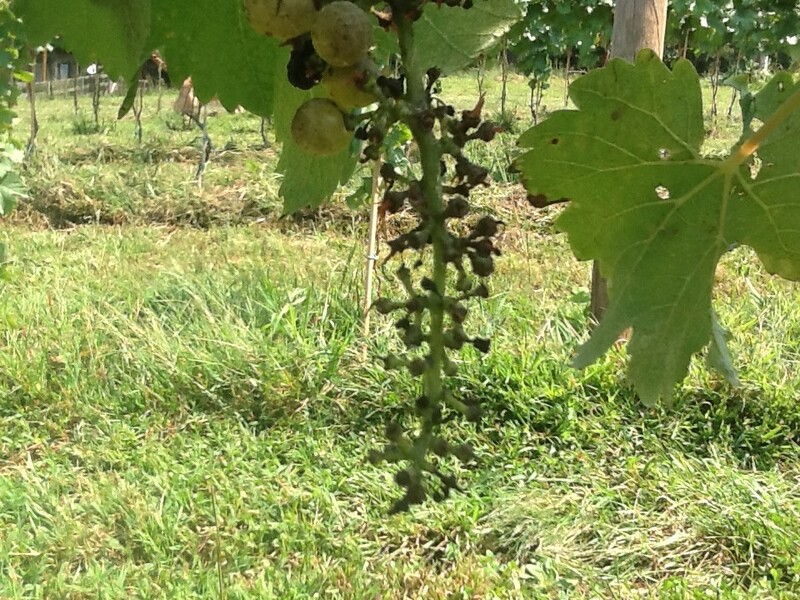 Powdery Mildew, Downey Mildew, Botrytis, you name it. And then came the pests: Japanese beetles, birds, raccoons, squirrels, deer, and even bears. Yes, indeed, bears. No lions or tigers,though. Just birds, deer and bears. And yeah, racooons and beetles and the rest of the pests. 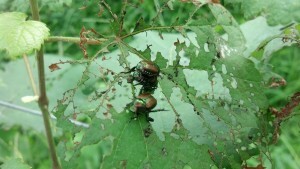 First came the Japanese beetles, but there were so many other predators that followed. That’s one of the reasons I’ve not been able to pay much attention to this blog. 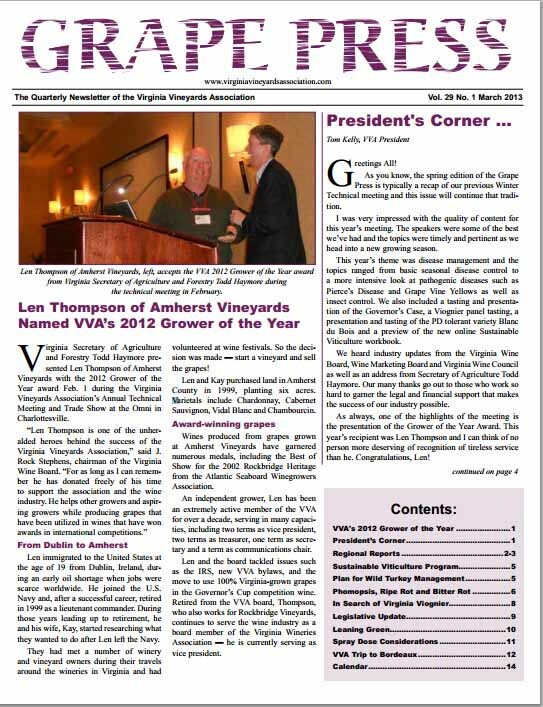 Another was that Chris and I took on responsibilities for editing Grape Press, the quarterly publication of the Virginia Vineyards Association. 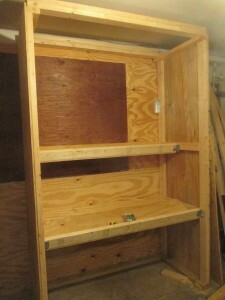 But mainly it was the challenges of the growing season. It seems like we spent all of our spare time each weekend keeping up with the vineyard. Spraying, cultivating, pruning, and spraying. Yeah, lots of spraying. It wasn’t easy. Let’s start with the late frost. I remember arriving at the vineyard early one Saturday morning to find our whites all but devastated. Honestly, it looked as though someone had sprayed Round-Up and left them to die. For a while, I actually wondered if they had been the victims of spray drift from the herbicide we had used to clear a row for new the new vines we had planted this year. Fortunately, that was not the case. After checking the temperatures recorded nearby, I realized that we had probably experienced at least one and possibly two frost events in which temperatures had dropped just below freezing for a few hours in the early morning. My reds were fine, but they are planted higher on the slope and there’s a good possibility that temperatures stayed a degree or two higher in their part of the vineyard. Alternatively, bud break came earlier for the whites and they may have just been victims of bad timing. I’ll never know. It turned out okay, though. 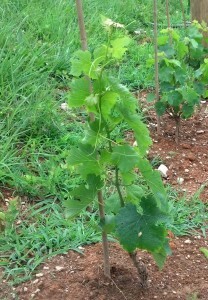 Both the Petit Manseng and the Viognier had enough secondary buds left to generate growth for this year. 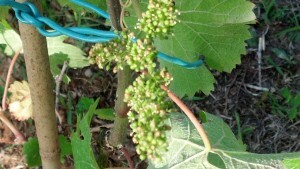 Within a few weeks, we were seeing buds break and shoots begin to develop. 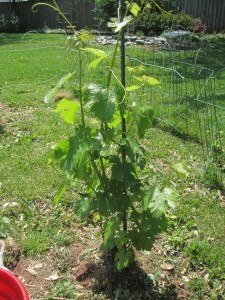 And by the middle of the summer, they were looking like grape vines again. So, all was well. 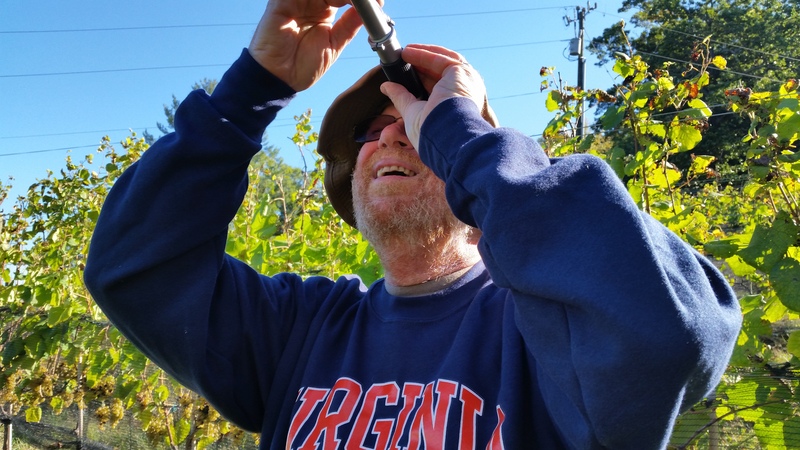 It’s a pleasure to announce that the Vineyard Goddess and I are now co-editors of Grape Press, the quarterly publication of the Virginia Vineyards Association. Our first issue is the just-published Spring 2013 edition, and while we took over editorial responsibilities too late to have had any role in the planning, we spent lots of time collecting articles, working with the authors on final edits, revamping the look of page 1, and dealing with the hundreds (well, dozens and dozens) of little details that come up as you’re going to press. We’re very excited about this opportunity for a number of reasons. 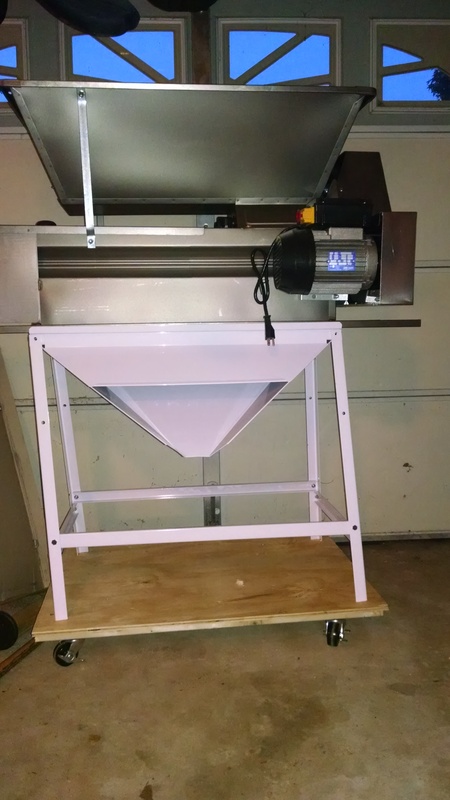 First, lots of folks in the Virginia viticulture community have been very generous with us, giving hours of their time to assist in our education. Early on, for example, I posted a note to a web site for the Central Virginia Winemakers group asking a question about how much time I should expect to set aside to manage a small vineyard I got lots of responses, and two of the folks who replied to my query hosted us at their vineyard for what amounted to a seminar on growing grapes. Secondly, we’re big fans of Virginia wine. We attended our first Virginia wine festival some 25 years ago, and while the wines weren’t great back then, some were pretty good, and we thought they all had promise. We were right. The wines got better each year, and today, we think Virginia wines have really come into their own. 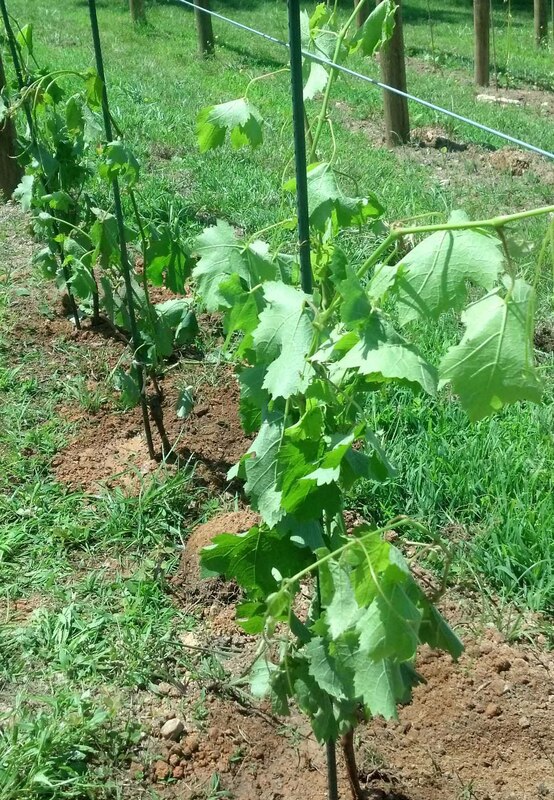 Virginia Viognier is a world-class wine. Cab Franc, Merlot, Petit Verdot, Petit Manseng, Norton and a number of other grape varieties have been made into truly great wines. My personal view is that a number of the Commonwealth’s wineries are making wines that can compete anywhere in the world, and their ranks are growing each year. As I said, we can’t take credit for the range of high-quality stories in the current edition, but we did have a chance to work with the authors, and it was one of the best journalistic experiences of my life. The writers were all involved in one aspect or another of viticulture, from the distinguished vineyard consultant Lucie Morton to grape pathologist Mizuho Nita to Ankida Ridge vineyard owner Christine Vrooman. The writers were knowledgeable and intelligent, and their articles were infused with personality and wit, which made them a pleasure to read. I won’t try to mention everything from this issue, but Christine Vrooman’s series on sustainability, Andrew Hodson’s article comparing French and Virginia Viognier, and Jim Benefiel’s story on a VVA expedition to Bordeaux are among those I would recommend to anyone. And honestly, there isn’t a bad article in the whole issue. Bill Freitag, Katie Hellebush, Pete Johns, Lucie Morton, Mizuho Nita and Dean Triplett contributed excellent articles, and they’re all worth a read. For what it’s worth, I read the entire issue, word for word, at least twice, and I enjoyed it as much on the final read as I did on the first round of edits. 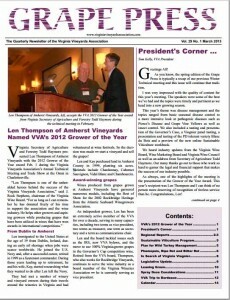 Membership in the Virginia Vineyards Association is a must for anyone involved in the Virginia wine industry. But Grape Press is great resource for anyone interested in viticulture, no matter where you live. It’s a great publication, and Chris (the Vineyard Goddess) and I will be doing our very best to ensure hat it continues to be great. 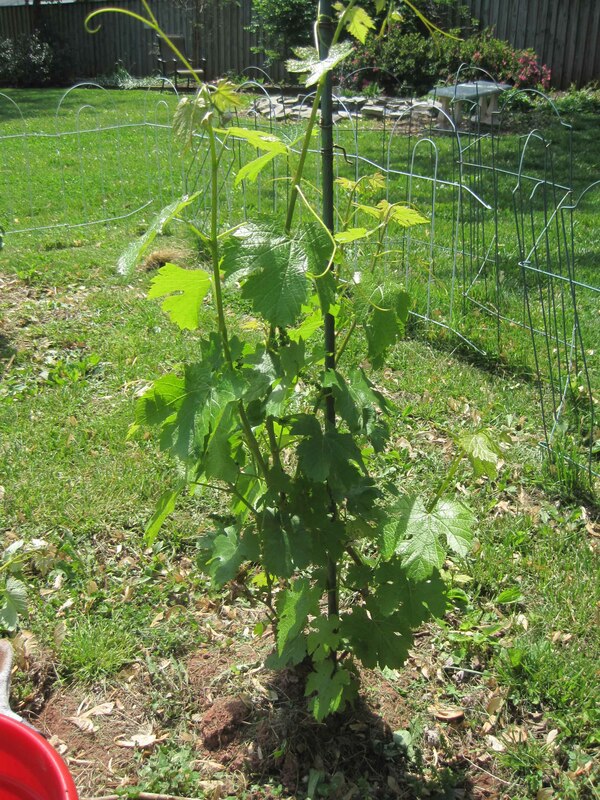 I’m still in the process of recovering from surgery and so unable to travel or tend a vineyard, but it turns out the vines are growing perfectly well without me. Who knew? 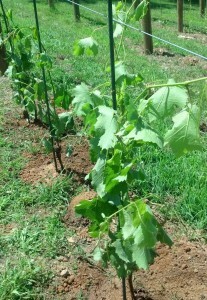 Here’s what one of the Cab Franc vines looked like before it was pruned and tied. 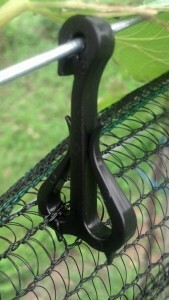 You can see the tendrils caught the training stake and are holding it straight. 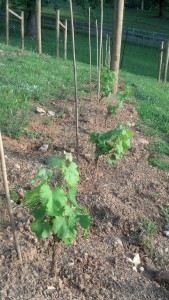 Still, young vines still need lots of care. 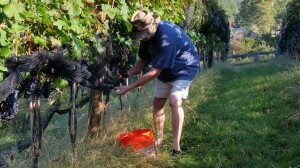 In my absence, Chris, the Vineyard Goddess, and daughter Kate were on site in Afton last weekend to prune the vines, tie shoots to the training stakes and handle other assorted chores (mowing and spraying, among them), and once again they provided pictures and a full report from the front. 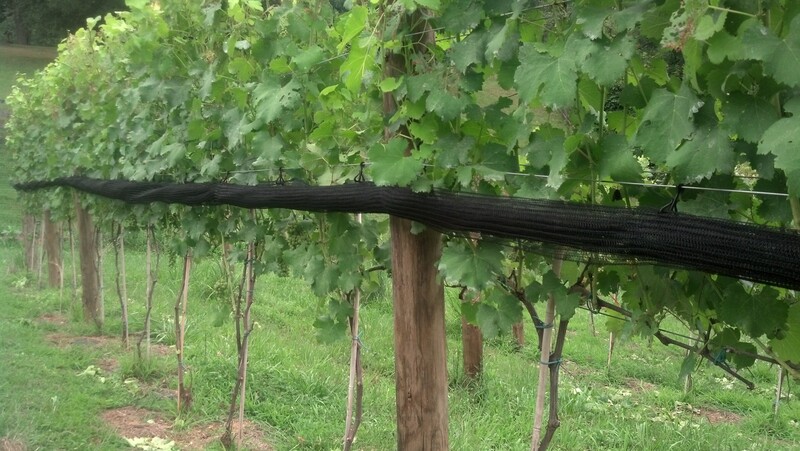 Tying the shoot to the training stake is an essential part of the vine’s development, and it turns out that there’s more than one approach to pruning and training first-year vines. 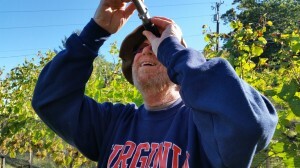 Tony Wolf’s Wine Grape Production Guide for Eastern North America, for example, suggests leaving two or three shoots on the young vine, so that you’ll have something left if deer or other predators find their way into the vineyard and begin chowing down, or if one or more shoots simply break. 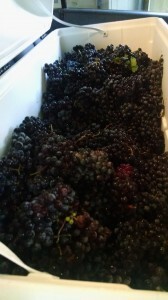 Here’s the Cab Francs after pruning and tying. Wes Hagen, Clos Pepe’s vineyard manager and a regular columnist for WineMaker magazine, suggests a different approach. Choose the best of the shoots, tie it to the training stake and then – once you are certain that the shoot you’ve chosen is safely on the stake – prune away the remaining shoots and any swelling buds. 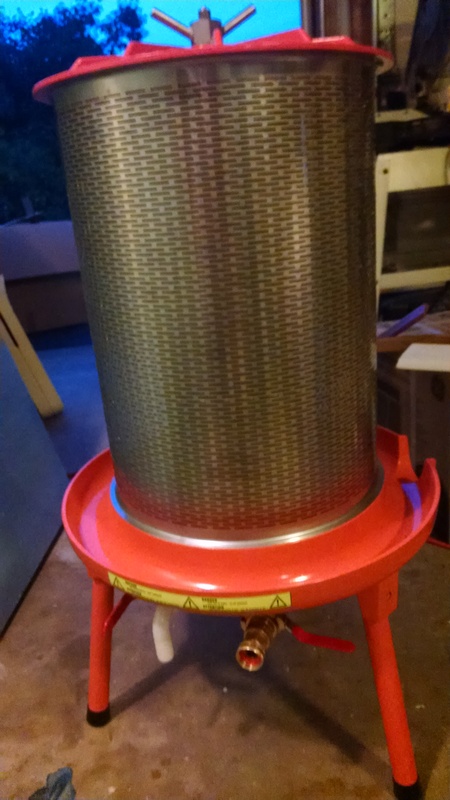 We went with this approach, and hopefully we’ll finish the season with strong and relatively straight trunks to support the vines in the years to come. 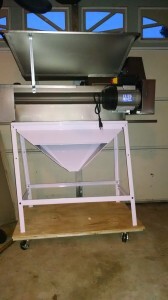 You can see the results in the photos. 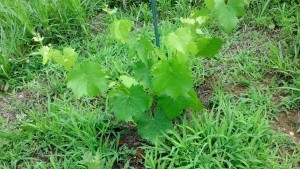 A Mammolo Toscano that we thought had been killed by frost is staging a comeback! All of the nearby pictures were taken before she mowed, so the vineyard is looking a bit ragged in these shots. The rows themselves are pretty clean (with the possible exception of the Mammolos), although in some pictures, the camera angle makes it look otherwise. 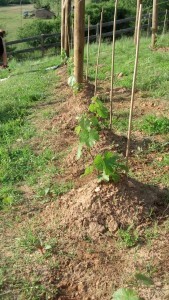 A row of Cab Franc vines in the foreground, with the first row of Petit Verdot just behind it. Despite months of crazy weather, it's finally springtime in the vineyard. And after all the hours of planning and research and all the work that went into getting the vineyard ready for planting vines – not to mention the planting itself – I was pretty bummed about not getting to see the early fruits of our labor this weekend. My wife, Chris, ably assisted by daughter Kate, the vineyard volunteer worker, traveled to Afton without me this weekend to un-hill new vines, continue the work on the deer fence, and handle a dozen other tasks that demand attention in the spring. So, this isn’t exactly an eyes-on report from the scene. It’s more like something cobbled together by an editor hunkered down in a newsroom, piecing together a story out of dispatches sent in by reporters from the front lines. I've been both a reporter and an editor in my life, and believe me, being a reporter is way more fun. Editors sit behind desks in newsrooms waiting for reporters to tell them what’s going on. When I was an editor, I generally got cranky while waiting. Reporters get out of the office and see things happen. Even in the day of Blackberries and instant communication, I'm sure they still keep editors at bay during the day by telling them there’s way too much going on to stop and talk. And they’re usually right. 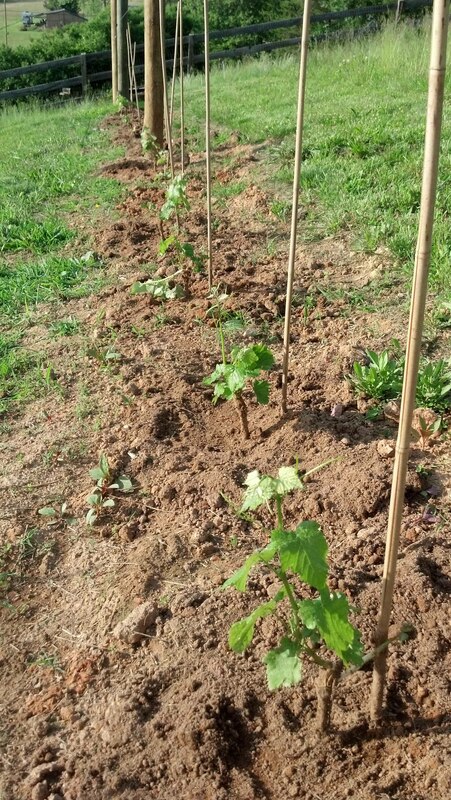 I’m particularly pleased with the progress of the first group of Cabernet Franc vines that we transplanted from our Fairfax vineyard two weeks ago. They not only survived, but they’re flourishing. And they have fruit! 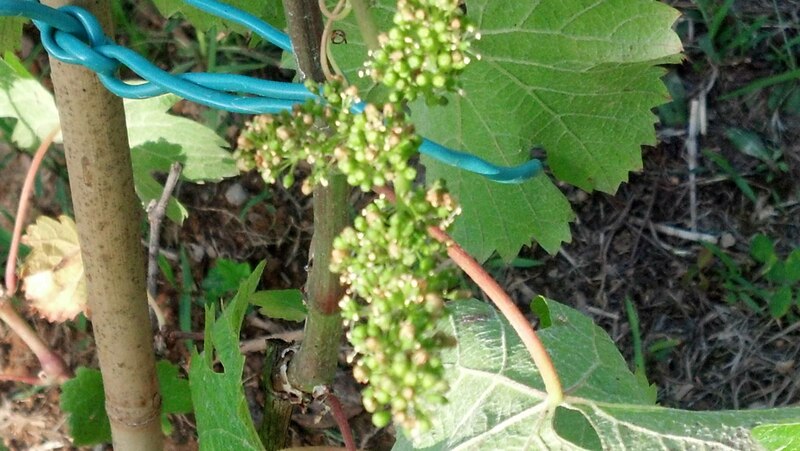 Big clusters of berries that will turn into grapes very soon if we leave them on the vine. Which, of course, we won’t. Even if the vines hadn’t been through the shock of being dug up in Fairfax and replanted in Afton, they’re still only in their second year of life, and they needto devote all of their energy to developing a strong root system and trunk. So we’ll be dropping the fruit soon. 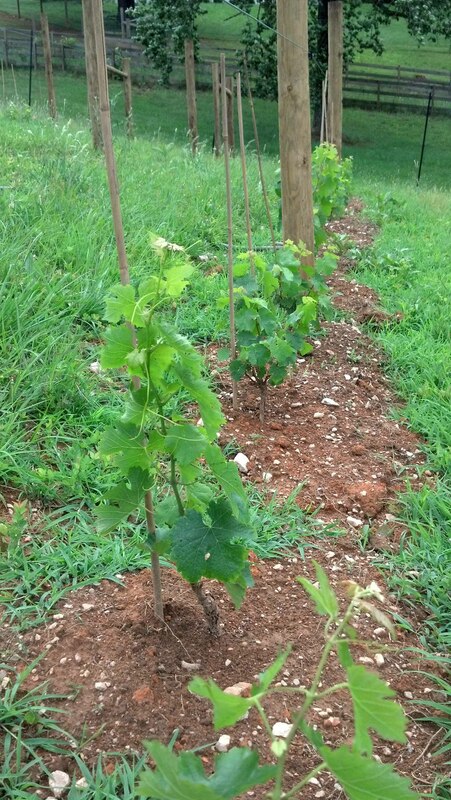 We had planted seven Cab Franc vines in Fairfax a year ago, all for the purpose of getting additional hands-on experience working with vines. 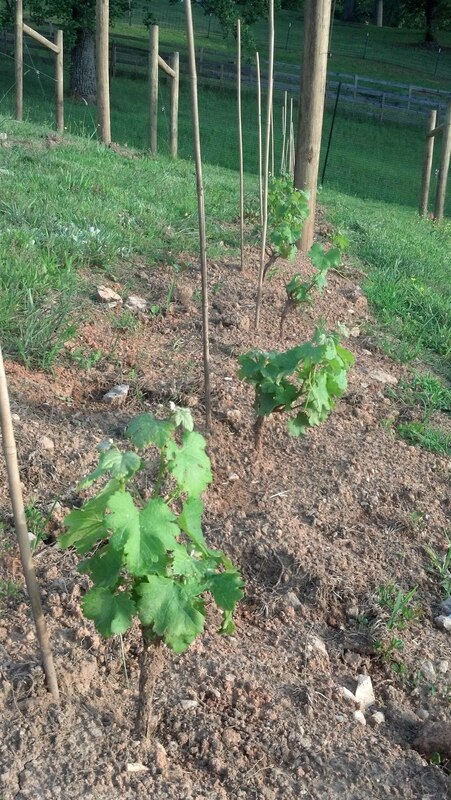 This weekend, Chris dug up the last three and moved them, so the Fairfax “vineyard” is officially defunct, although it lives on in spirit in Nelson County. We can’t be sure that all seven will make it, but we’re very hopeful. 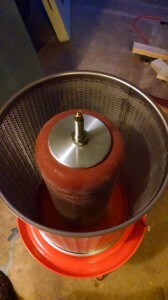 In any event, I'm glad we tried this experiment, which was prompted by an article by WineMaker’s magazine’s Wes Hagen. He recommended ordering extra vines and planting the excess closely together on some spare land. 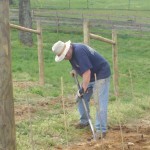 That way, you have some surplus vines to replace the ones that inevitably will die. And that’s one of the sad facts of viticulture. No matter how good you are, no matter how carefully you plant, and no matter how great the nursery you buy from, you’re going to lose some plants. 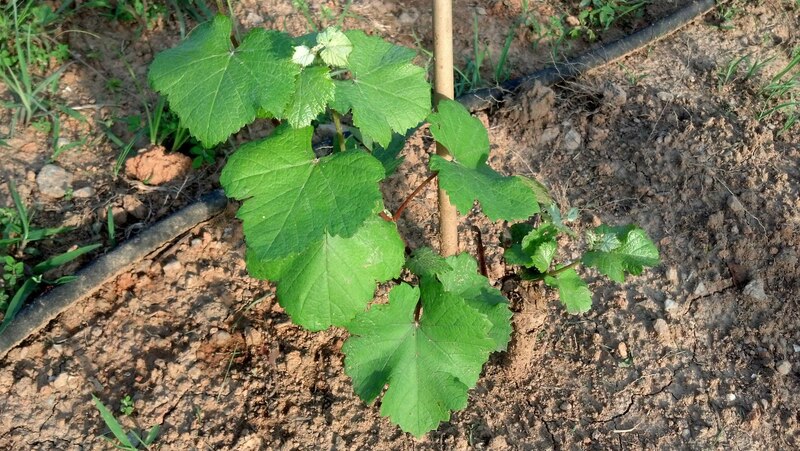 So, even though some of the 50 Cab Franc vines that we planted this year will surely die, with the additional one-year old vines Fairfax we should end up ahead of the game. Wish I had read the Wes Hagen advice before we ordered vines for planting this year. 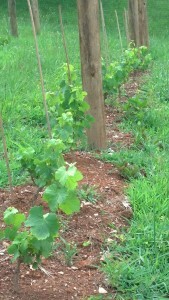 Looking at the rest of the vinyeard, our whites are doing quite well. We planted 25 each of Petit Manseng and Viognier on the weekend of March 31, and mounded hills of earth over them, covering the graft union with about two inches of soil to protect the dormant vines from the possibility of late frost. We un-hilled them two weekends ago on May 6, and they have been doing quite well ever since. 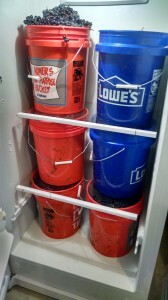 Likewise, the reds are showing great promise. 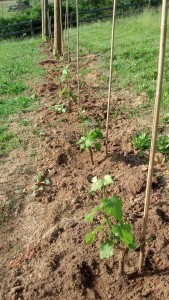 Chris and Kate un-hilled the 100 Cab Franc and Petit Verdot vines that we planted over three days in early April. 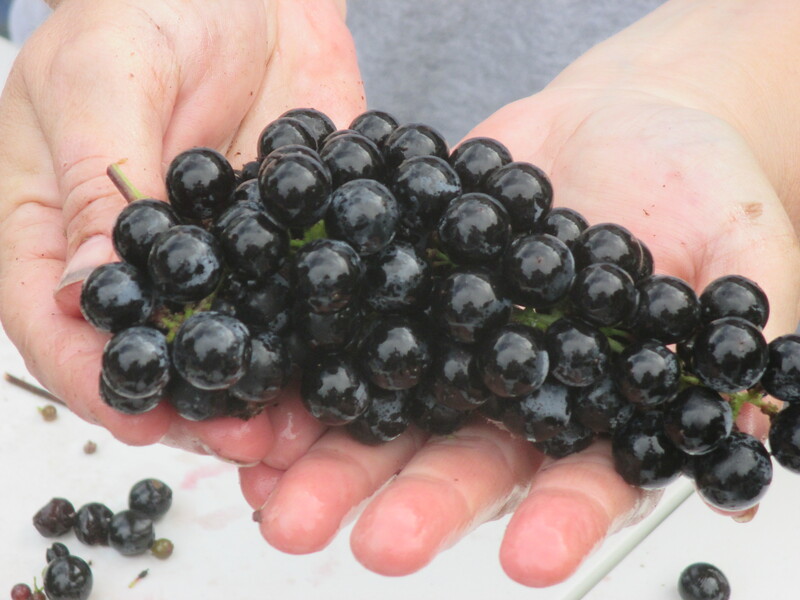 Both grapes seem to do well in Virginia, and we are wildly optimistic about their potential. Which, of course, puts us in the company of farmers everywhere who start each spring full of optimism, no matter how bad the previous year went. And don’t get anyone started talking about the 2011 vintage. Trust me, just don’t. 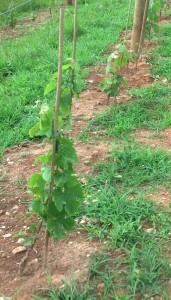 A row of Viognier vines - all healthy so far! By the way, the un-hilling I did two weeks ago involved a lot of careful work with my hands, but it was positively crude compared to Chris’s method. 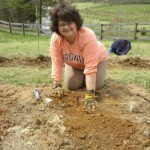 I pushed the dirt aside a little bit at a time, until the vine was completely uncovered. Okay, maybe a spare bud or two got knocked off in the process. Chris would have none of that. 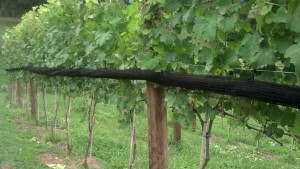 She bought a makeup brush for the final removal of soil from the vines, and claims it worked like a charm. I wasn’t there, so I’ll take her word for it. It seems like a pretty time-consuming approach, so I’m pretty confident that I’ll do my part of the un-hilling next year sans the makeup brush. Unless of course the vines she un-hilled do better than mine. Let’s not even go there, okay? 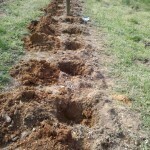 With the new vines in the ground and growing beautifully, the need for a deer fence was growing ever more urgent. Deer are only one of many pests that will go after the grapes once the fruit reaches a certain level of sweetness, but they will also go after the shoots themselves. 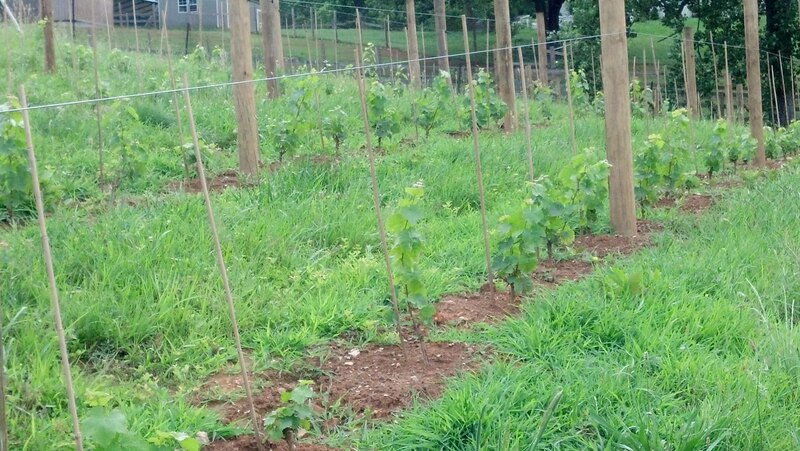 With all the work we put into this small hobby vineyard, we don’t want the vines to end up becoming a McDonalds for the local deer population. The entire property has a three-board fence, with added wire meshing — good for keeping critters off the property, but not high enough to stop deer. This seemed like an easier task than putting in the trellising system, but even so, we spent a fair amount of time researching deer fences over the previous month. 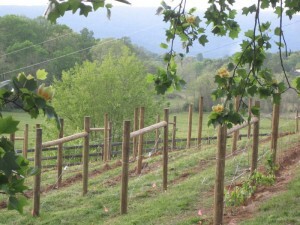 In our division of labor, I had worked out the details on the trellis, and my wife, the Vineyard Goddess, devoted herself to the deer fence. 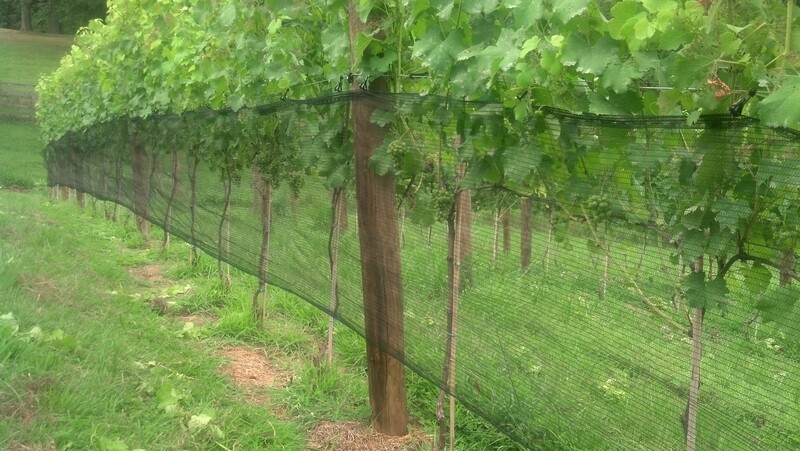 Traveling around area vineyards, we got a sense of the variety of fences that were being used. 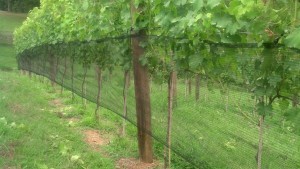 Some vineyards have installed metal fences as high as 10 feet, but that seemed like overkill for us. 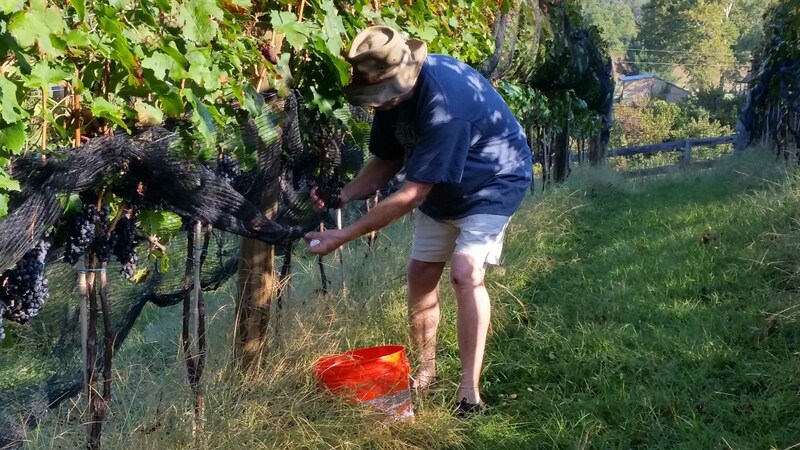 Our property is already surrounded by a four-foot high, three-board wood fence that has a metal mesh fence attached to keep small critters out and our two Vineyard dogs in. We briefly toyed with the idea of doing something to raise the height of that fence by another four feet all around the property, but rejected that approach for two reasons. 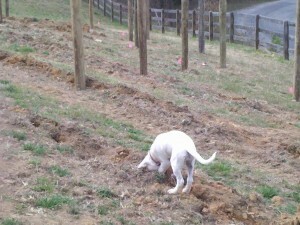 And here Glory is demonstrating why a separate fence around the vineyard itself is absolutely essential. 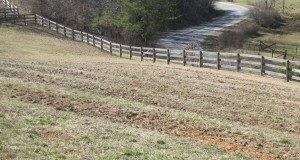 First, it’s a whole lot of fence — about 1,100 feet. For about $8 a foot, we probably could have put in a fence that would be way more utilitarian than aesthetically pleasing, but this property will someday be our home, so we’re going for aesthetically pleasing. And second, while it would keep our dogs from wandering off the property, it would do absolutely nothing to keep them out of the relatively smaller vineyard area inside our property. 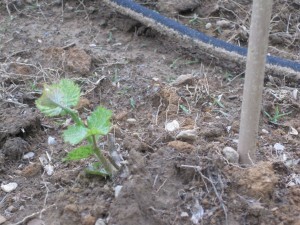 Three weeks after planting, the Viognier, pictured here, and the Petit Manseng, are emerging from the mounds of dirt that protected them from the spring frosts. we planted two weekends ago, were still hidden away, but the whites we planted a week earlier – the Petit Manseng and the Viognier – were poking through the hills, and we were just thrilled to see them pushing through the earth! I have to say, they emerged from the mounds at just the right time, avoiding the frost that killed off our two prize Mammolo Toscano vines the previous weekend. Frost is an issue that we’ve been giving a lot of thought to after our experience this winter, and it influenced our decision on where to locate the fruiting wire. More on that in a future post. 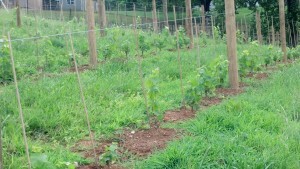 The Fairfax vines looked magnificent this Spring -- if a bit unruly. They need to be pruned, but that, I decided, would wait until they reached their new home. wanted the experience of being able to go out in the evening after work to care for them and learn from that effort. 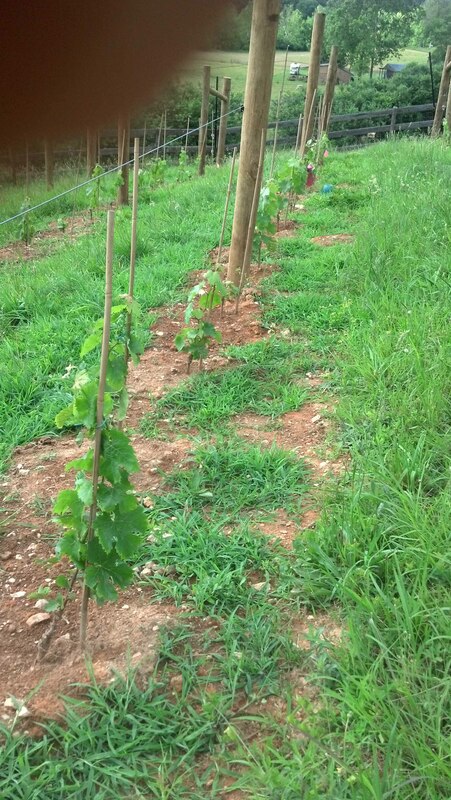 We planted another five of the same clone and rootstock in Afton to see how the same vines would do in a different environment.